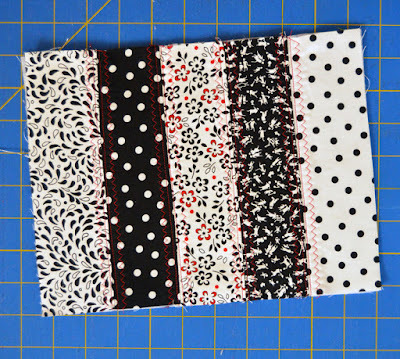 Today's tutorial uses Virginia Robertson's new Thoroughly Modern fabric collection (so much black, red and white fun!) to make two different pouches. You'll notice that we added in a few Painter's Palette Solids in the smaller pouch--we were inspired by the solids used in Virginia's free quilt pattern. 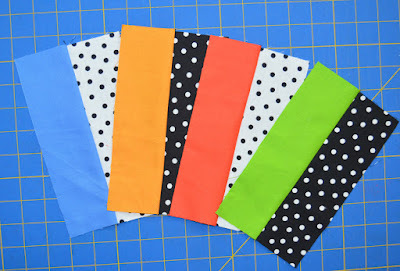 Check out the tutorial and then scroll to the bottom of this post to see how you can enter to win a FQ bundle of Thoroughly Modern fabrics. Step 1: Lay out (1) 2-1/2" x 8" strip of each fabric as shown. Sew the strips together. 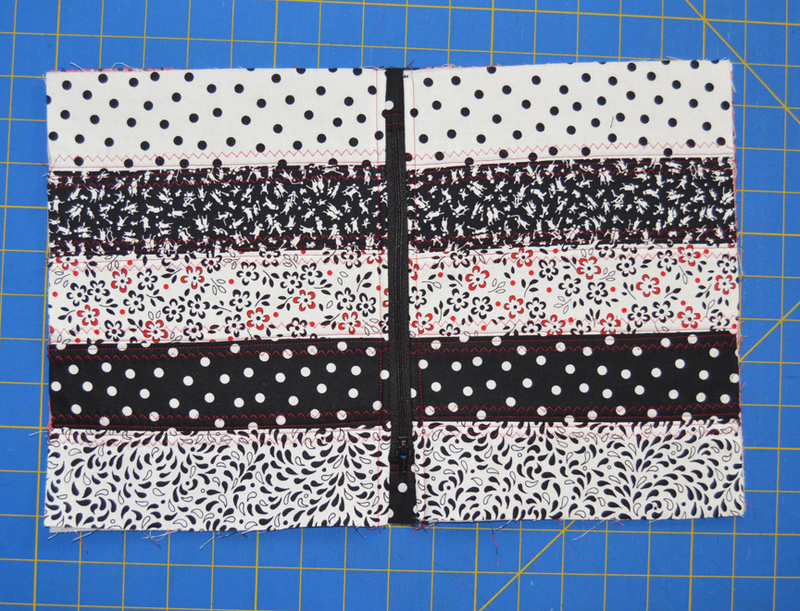 Step 2: Layer the pieced strip with a piece of fusible batting and fuse in place. Machine quilt as desired. We had fun using red thread and a zigzag stitch so the stitching really pops! 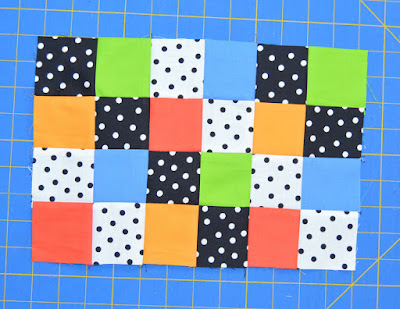 Make (2) quilted panels. 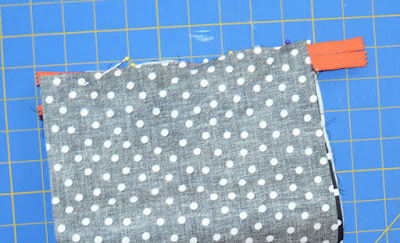 Step 3: Fold both short ends of a 1-1/4" x 4" white dots on black piece in 1/4". Fold the entire piece in half. 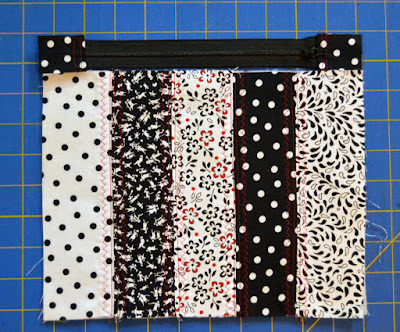 Tuck the zipper pull end of the zipper into the center crease and fold the dot fabric over to enclose the zipper (our photo shows the non zipper pull end instead--don't do this end yet). Topstitch across the pressed edges to secure the tab to the zipper. Step 4: Align the zipper with the top edge of a quilted piece. Mark the opposite end of the zipper even with the quilted piece. Step 5: Stitch across the unfinished zipper end just inside the marked point to secure the zipper. Cut the zipper off where marked. Use the remaining small polka dot piece to enclose the raw end of the zipper. 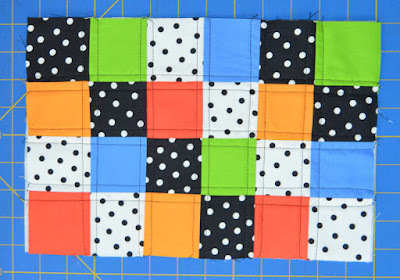 Your zipper (with fabric ends) should be the same size as your quilted piece as shown. Step 6: Position the zipper face down on the quilted piece and pin in place. 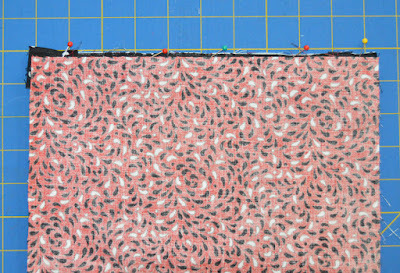 Lay (1) 8" x 12-1/2" teardrops on red piece on top, right side down, and pin. Using your zipper foot, stitch through all layers. 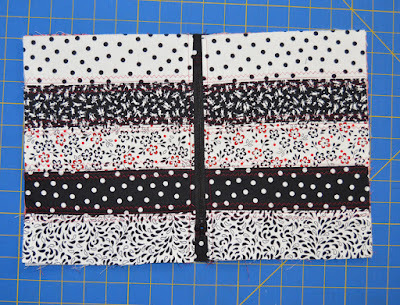 Step 7: Repeat on the opposite side of the zipper using second quilted piece and backing piece. Note how we aligned the stripes to match on both sides. Press fabrics back from the zipper and topstitch 1/4" from each zipper edge, making sure quilted top and lining are laying flat. Step 8: Fold the pouch so the quilted pieces are right sides together on one size of the zipper and the lining pieces are right sides together on the other side. Pin layers together. Stitch around the outside edge, leaving an opening along lining edge for turning. Step 9: Clip corners, turn right side out, stitch the opening in the lining closed. Stuff the lining inside the pouch. 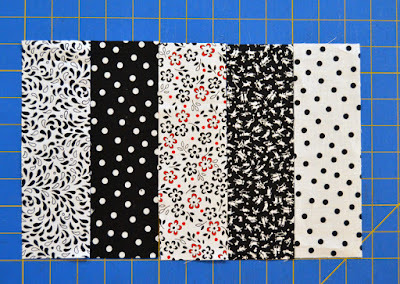 Step 1: Pair each 2-1/2" x 8" polka dot strip with a solid strip. Step 2: Sew the polka dot strip and solid strip together in pairs to make a strip set. 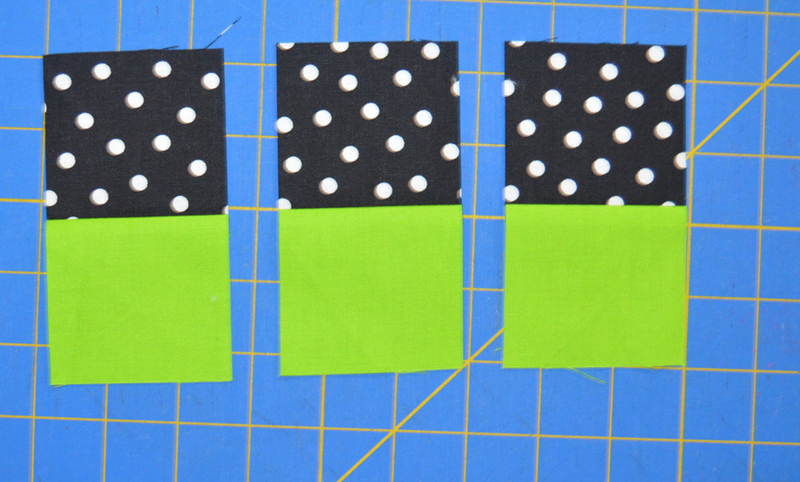 Step 3: Cut each strip set into (3) 2-1/2" segments. 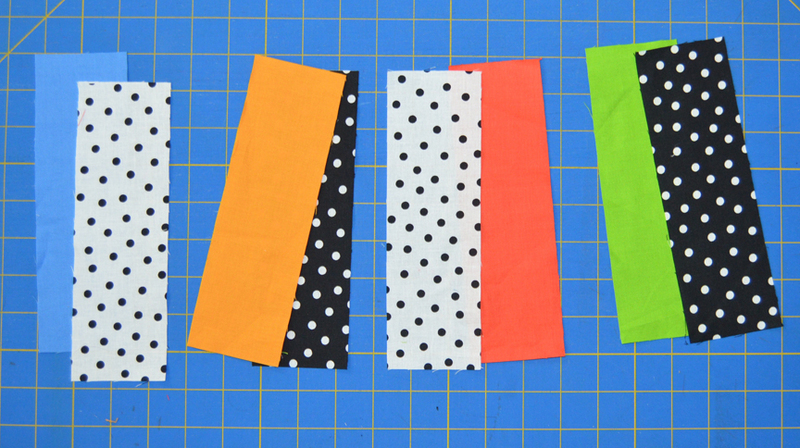 Step 4: Lay out the segments into a pattern you like (or see ours below). 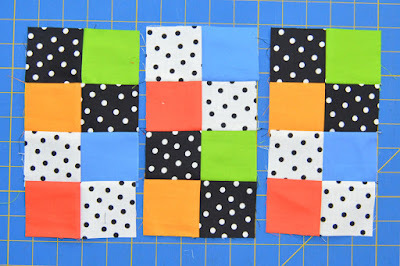 Sew the segments into columns as shown. 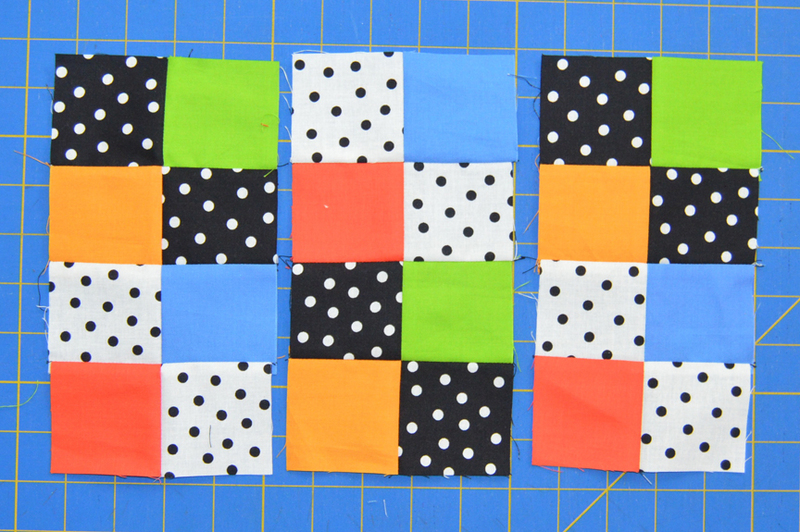 Step 5: Join the columns to complete the patchwork piece. Step 6: Fuse the fusible batting piece to the back side and quilt as desired. We quilted 1/4" on each side of the seams using black thread. Step 7: Lay the zipper wrong side down on the patchwork piece. 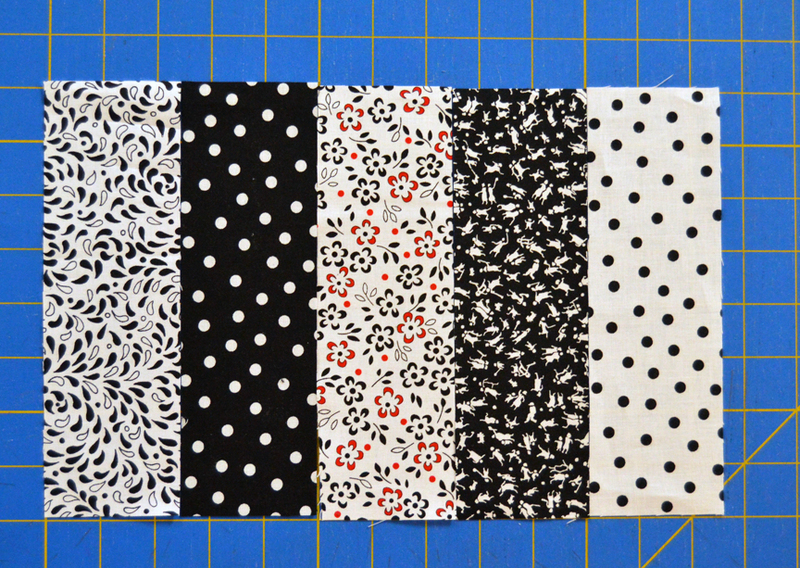 Lay the 8-1/2" x 12-1/2" white dots on black lining piece on top, right side down. Stitch with the zipper foot. 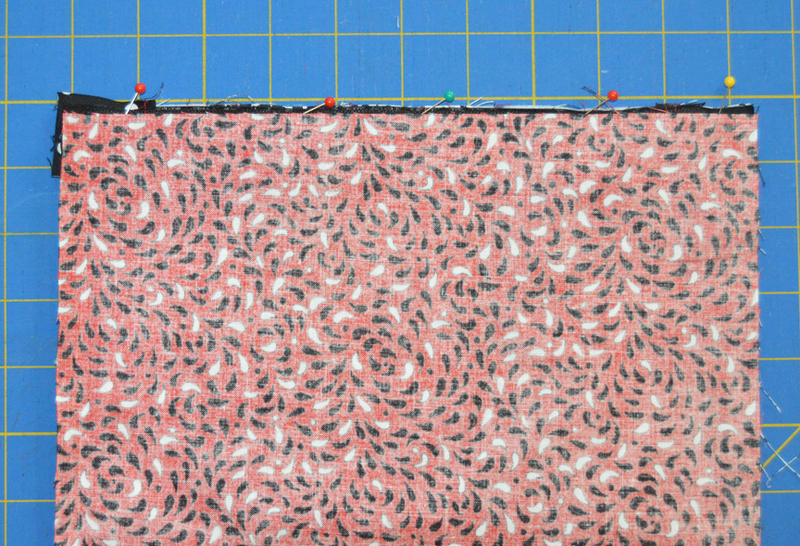 Press fabric away from zipper and topstitch 1/4" from zipper edge. 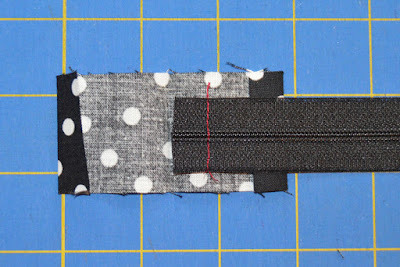 Step 8: Fold the patchwork piece around, creating a tube, and pin the other side of the zipper (right side of zipper facing right side of patchwork) to the opposite short edge. Do the same with the backing fabric. 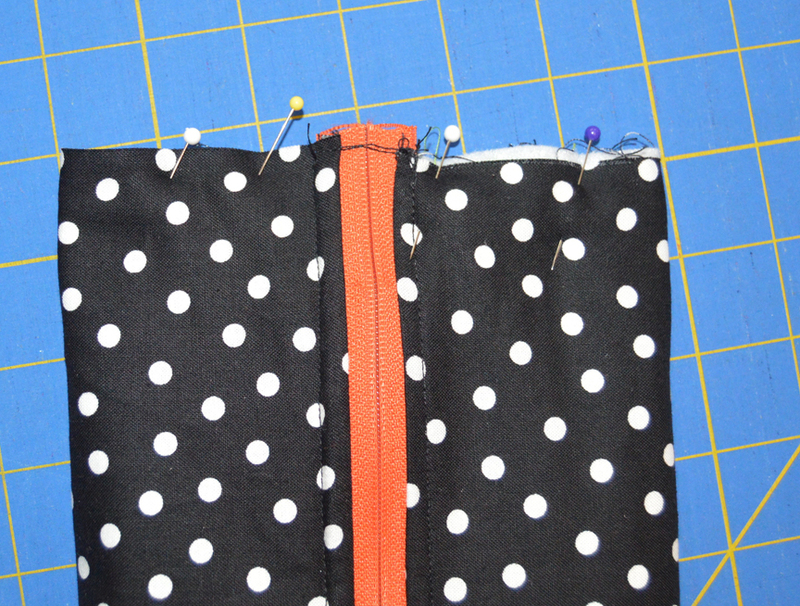 Step 9: Stitch to secure the second edge of the zipper. Fold fabric back and topstitch 1/4" from zipper edge. Because it's a tube, this will require some manipulation, but it's do-able. Step 10: Arrange the tube as shown below, so the patchwork side is facing itself (inside the lining) and the zipper is centered on the top. Stitch along the zipper near the fabric edge and trim fabric. Step 11: Stitch along the bag to secure the edge. Repeat on opposite end. Clip corners. 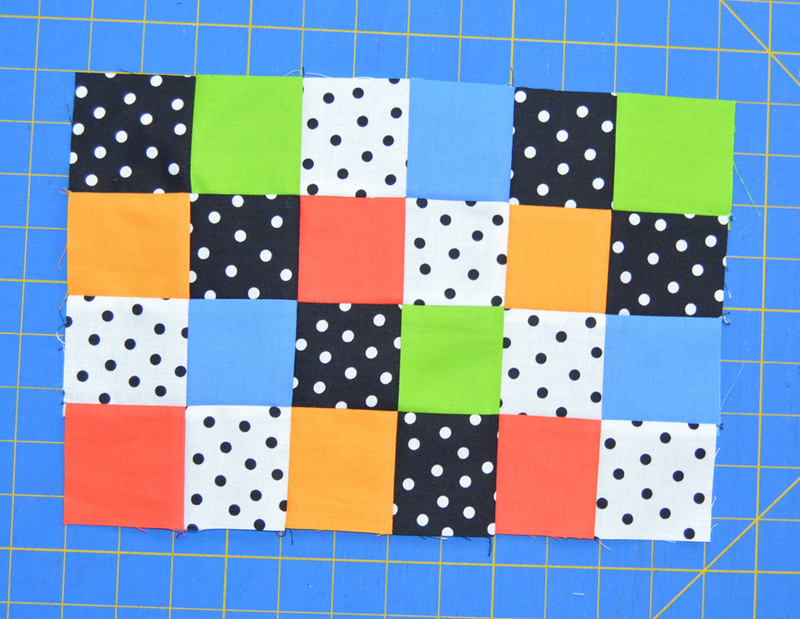 Zigzag stitch to create a finished look on the raw edges on both ends. Turn right side out. 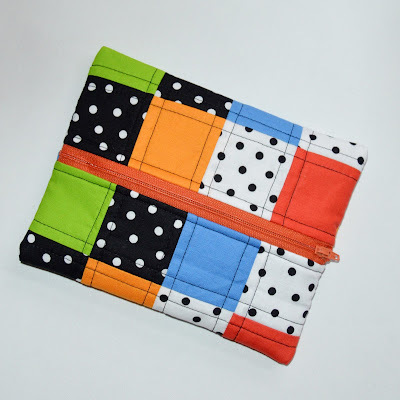 Zippered pouches are so much fun to make and use! We bet you won't make just one! For a chance to win a fat quarter bundle of Virginia Robertson's Thoroughly Modern collection, leave a comment below telling us what you do (or would) use a zippered pouch to hold. Giveaway is open through Sunday, August 27th at 11:59 PM CDT. These little pouches are so adorable. I love making and using them. I use them for lots of things, but my favorite is keeping one in my purse for loose change. Thank you for the giveaway. Pouches are great to hold what I need for english paper piecing as a to-go bag. I also love them as a gift, with perhaps a gift card inside. In my Go Bag, I always need a little pouch to hold my electronics: camera batteries, back up cords, etc. This would be perfect. I make these to keep little items in my purse from getting lost (lol) plus, I make them to keep all sorts of quilting items in from hand projects to certain colors and sized scrap pieces. Thank you for the great tutorial and the awesome give away! I would use it to hold small items that I keep in my purse so I can easily find them without having to take everything out of my purse. The uses for pouches are endless! I use them for small items in my purse or things I need when I go for a walk or make a quick run to the store. They're also great to keep projects in order when traveling. I also use larger ones to keep paperwork together. Thanks for the tutorials and this giveaway! I put quilting supplies in mine. They seem to walk away and hide if I don't keep them under control! Coincidentally, I was looking for a pouch tutorial just this morning. I need one to keep my IPod, buds, and cord corralled. Thanks for showing up at the right time! Just got a new car, so now I need a matching pouch to keep my stuff organized there! I would put receipts in it. They take over everything. These pouches are so beautiful.I love gift them and use them to my stuff.Right now I have one in my bag and other with hexie papers. I use one for my "loyalty club cards" - those cards you get stamped when you go to different stores. I love using pouches to hold the techie cords that we seem to have for everything. Love your pouches. I use a zippered pouch to hold my cosmetics. I would use it to hold small items in my purse, or makeup. I have two zippered pouches in my purse at all times! One of them holds small items like dental floss, make up and band aids. The other one holds my coins to keep my wallet lighter and less bulky. I need a new one like this in the post...it's great! 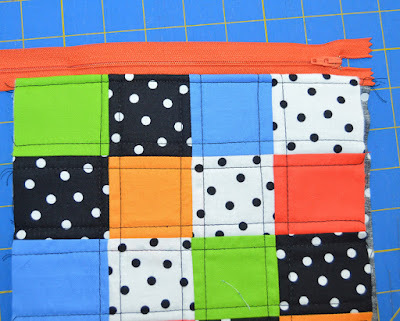 I use zippered punches for lots of things. I use them for traveling to keep my phone and iPad chargers organized, my makeup goes in another. My blow dryer and a few toiletries in yet another, the list goes on...very useful!! 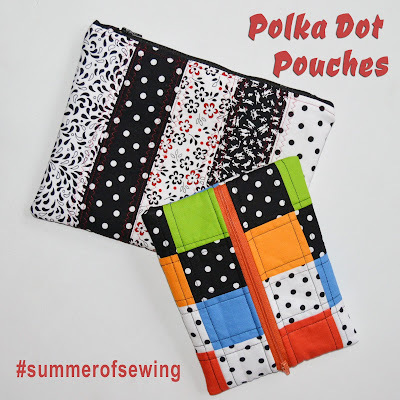 I love those zippered pouches to carry sewing notions in or to carry special things in my suitcase. Thank you for the the great toutorial. 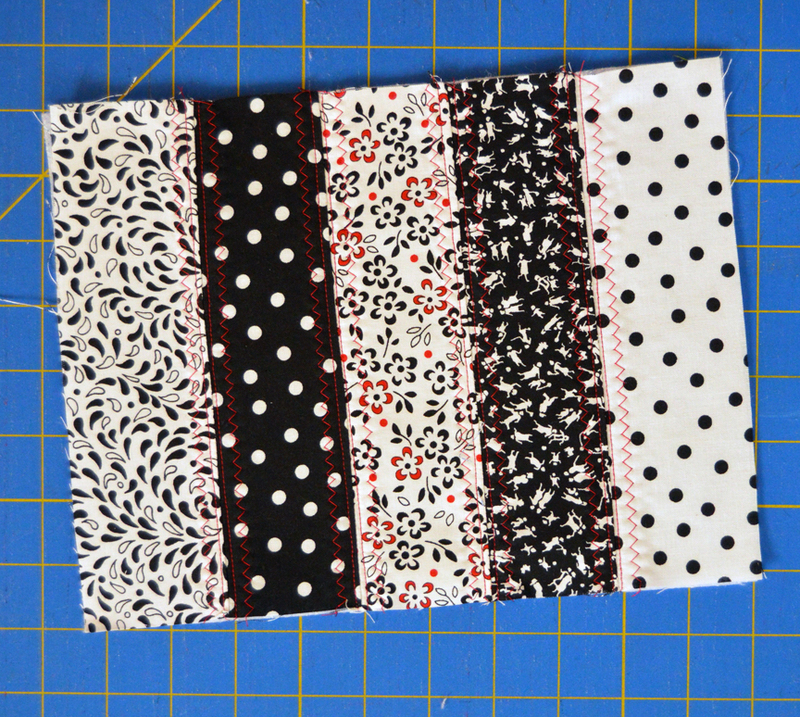 I'd make a zippered pouch to carry around my supplies for hand applique - scissors, thread, pins etc. 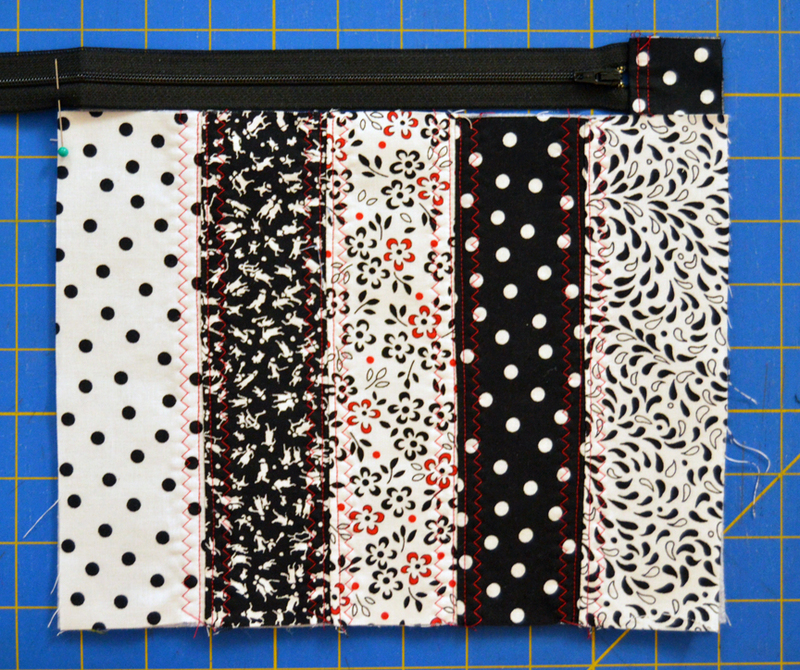 I like keeping my binding clips in a zipper pouch. 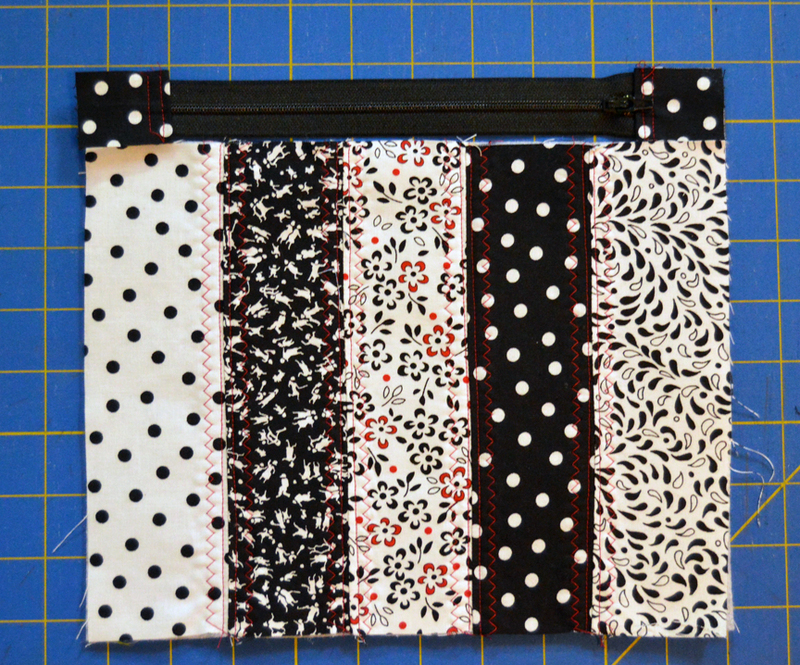 I love these zippered pouches! I would use one first for embroidery supplies! I use a zipper pouch to keep a few treats in my purse so if I get hungry while doing errands, I'll grab a treat and avoid stopping for fast food. I would use it for a coin purse. Also would be great to hold my marking pencils, tape measure, small scissors etc. for taking along to sewing sessions. I would put thread, needle, scissors and keep it in the car for the appointments etc so then all I have to do is grab the fabric. I love your pouches and would use one to hold my wonder clips. I have them in a open bin, and they tend to spill out. This would be a great way to keep them organized. I love this little pounch. Thank you for the tutorial. I desperately need a new make up pouch. Thanks! I carry a zip pouch with me when I go to fitness classes at the local YMCA. It's a handy way to carry my membership card, my car keys, and some hand sanitizer. I like to use the zippered bags for small items in my purse. Thanks for the giveaway and ideas. I like to use them to hold thread and scissors when I'm traveling for hand projects. I like to use them for charging cords. It seems like I use more of them all the time. 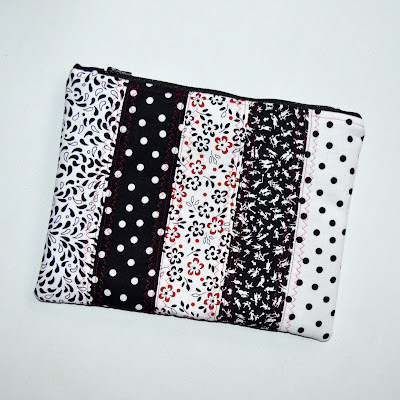 I use zippered pouches for make-up, traveling sewing kit, jewelry to name a few. 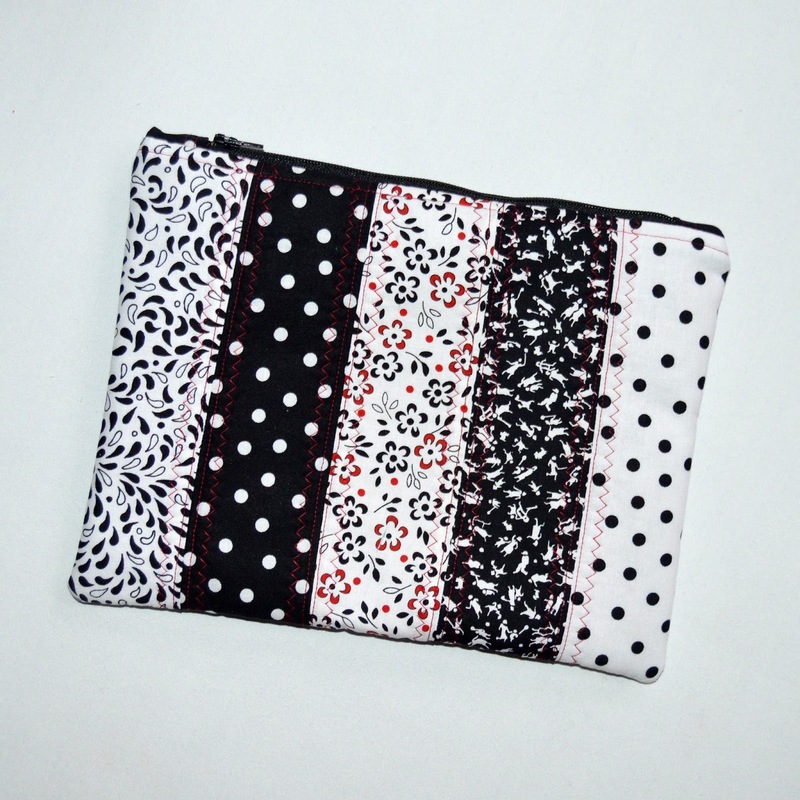 Cute polka dot puches, I think I must create one pouches to store my saree. It can also be work as my saree cover.